Offering a spacious and warm toe space, the Rip Curl Flash Bomb 5mm Round Toe Boots deliver all the same fiery heat as their Flash Bomb Split Toe counterparts. Starting with a soft and cozy Flash Lining and then internally sealing the seams with flexible Flashline tape, the Flash Bomb Boots envelop your feet in a capsule of warmth and comfort. A unique slide on system that utilizes an inbuilt Achilles strap makes for easy on and off, while the performance engineered single layer 0.8mm sole delivers the much sought after hypersensitivity between you and your board. 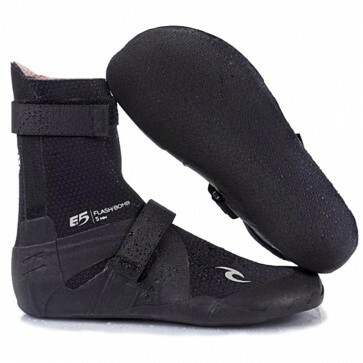 With an antimicrobial treatment that helps to chase away stinky bootie smell and two compression straps that are built into the rubberized support structure with watertight stitchless technology the Rip Curl Flash Bomb Round Toe Boots bundle all the best features for the ultimate surf boot. Boots keep your toesies warm for sure, only problem I have found so far is that they are not very sealed and you end up with a lot of water in them at the end of a session. But if you like some good booty juice then these are for you!